Nintendo had nothing to offer on the smartphone front for half a decade, but it hit a home run with Pokémon Go back in 2016. It's still a wildly popular app, but it's not always intuitive. Even now many players are still in the dark on some of its less transparent features. To help you catch 'em all, here is a list of the best Pokémon Go tips and tricks around. If you're a veteran Pokémon master looking to keep your game tight, then jump ahead straight to our list of best tips and tricks. But if you're a new player just getting started on your Poké-journey, we've put together a handy guide to the basics. Poké Balls: these balls are used to catch wild Pokémon. In the beginning, you earn Poké Balls, then Great Balls and later, Ultra Balls. Potions: from level five onward, you also get potions and revives. That's because you are now allowed to battle in gyms. When your Pokémon are injured, you can revive and heal them with these items. Incense: incense is designed to attract more wild Pokémon to your location for 30 minutes and will therefore allow you to catch more than your usual share. Razz Berries: from Level 8 onward, these berries can help you a lot. You use them to help you catch wild Pokémon more easily. They are especially useful when you find a strong but unruly Pokémon. Pinap Berries: these pineapple-looking berries were introduced with the gen 2 update. They double the candy you receive when catching Pokémon. They come in handy for those looking to evolve their pocket monsters quicker, but in order for them to work you need to catch the Pokémon right after feeding it the Pinap Berry. If not, the effect wears off and you need to use another one. PokéStops can be found everywhere on the virtual map. They allow you to collect new items and 50 experience points each time you spin them. The items may vary depending on your level. You almost certainly have noticed the colored PokéStop-like structures. They are called gyms and are a ton of fun. You can access them after reaching level 5. Take advantage of them by fighting with your Pokémon. This allows you to earn experience and PokéCoins (which can only be acquired through in-game purchases with real currency otherwise). This is the in-game currency of Pokémon Go. With these coins, you can acquire special items that are either rare to find or available through purchasing only. As such, they are not absolutely necessary for the game, but they can help you advance faster. You can select team from Level 5 on. There are three teams which you can choose from: Team Mystic (blue), Team Valor (red) and Team Instinct (yellow). The best thing to do is select a team your friends have already joined. Of course, not unless you want to challenge them and steal their gyms away from them. The AR Pokéverse conjured up by Niantic isn't the most punishing game around, but there are still ways to make sure your rise to fame and fortune as a Pokémon master. This is why we've put together a list of the best tips and tricks for Pokémon GO. We've divided them into general tips, which are best for new and returning players and advanced for those who want to step up their game. Follow our guide and be the very best! 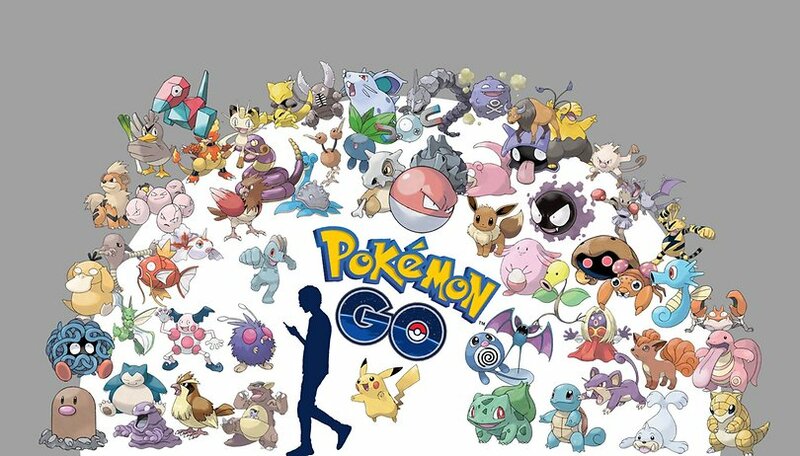 The Pokémon tracking system has changed multiple times during the game's life. The step system and Sightings are now things of the past. Currently, you can detect Pokémon in your vicinity by tapping the white bar on the bottom right of your screen. The window which pops up will reveal nearby Pokémon (as a silhouette, if you haven't encountered or caught them previously). Behind them is a picture of the PokéStops near which they spawned. Tap on it and then on the three steps below to locate the stop on the map. Don't take too long if you don't wanna miss that Pikachu though. Pokémon usually don't stick around at the same location for more than 40 minutes. Another thing to keep in mind is that the Nearby menu doesn't show all Pokémon close to you. So explore and catch 'em all! Tracking steps with the app closed has been a feature requested since the release of Pokémon GO. It's finally here in the form of Adventure Sync. To enable it, you first need to install Google Fit or Apple Health, depending on whether you are using an Android or Apple device. After that, you can simply go into the Pokémon GO settings menu and tick the Enable Adventure Sync option. Tap on your profile icon in the bottom left corner. Scroll down until you see Weekly Progress. You should see rewards and the eggs that are in progress of hatching. Under the eggs, on the right side, are Steps and Calories. Tap on them and enable Adventure Sync. You should now be able to hatch your eggs much more easily without draining your battery or using up all your mobile data. You will also receive weekly rewards depending on the distance you walked, most of which are Poké Balls. If you take the tram, bus or overground train to work, this is a great opportunity to stock up on some Poké Balls and other items. You likely won't be able to catch Pokémon because of the speed, but you can still quickly swipe some items. The number of Poké Stops will differ depending on your route, but you should be able to cash in on them even when flying past. Just have your phone ready and start spinning that dial before you approach. This is my number one time-saving tip, and I didn't find this out until days after I started playing. At a PokéStops you don't need to physically tap all of the bubbles in which the items appear. Just hit the X button and they'll be added to your inventory. Yes, really. You should catch every Pokémon you find, even if you already own it or its evolution: you still receive additional candy and you can trade it to Professor Willow for even more candy. More importantly, catching Pokémon gives you stardust, which you can use to power up your pocket monsters to the max or to unlock a Pokémon's second charged attack. Stardust also essential when you want to trade with friends. Before you can trade, you need some friends first. If you have some that play Pokémon GO already, just ask them for their trainer code or share yours. The app even provides a Share my trainer code option through which you can send it directly to their WhatsApp or other messaging profiles. Even if are the lone Pokémon GO enthusiast left in your friend circle, don't fret! There are many Pokémon GO communities online. I can personally recommend the Reddit Pokémon GO Trades one. After you've added some friends, it's time to exchange some gifts. You can send and receive one from each friend daily. They drop from PokéStops like most other items. Gifts are a great resource for earning Poké Balls and stardust, especially when you are a new player. To send them to your buddies, go to your profile and tap on Friends in the upper right corner. You will see a list which you can select from - just tap on the desired profile and then Send gift. Your friend will receive a notification about it next time they open the app. If you are a returning player you might not know about this new addition to the game. You now get extra stardust, xp, Poké Balls, etc. when you make your first catch of the day or spin your first PokéStop dial. The rewards get better with each consecutive day you play. Don't miss out! The battles are not only a ton of fun but you earn rewards from them even if you lose. The best you can get rare evolution items such as Sinnoh Stones. If you want to battle friends, you will either need to have a high friendship level or be near them to scan their QR battle code. However, you can also battle the NPC team leaders Spark, Candela and Blanche. Their Pokémon types correspond to their team, so be prepared! Rewards are earned only from the first 3 battles every day. One of the tricks that will help you level up the fastest is checking the in-app news. New events with cool rewards and bonuses, community days, raids and so on, are constantly popping up. Catch those shiny Pokémon! Although not initially available, raids are now at the core of the Pokémon GO experience. They often provide a chance to catch a rare Pokémon and to earn experience. You can check if there's one happening near you from the same menu at the bottom right corner that helps you locate Pokémon. The icons underneath indicate how strong the raid boss is. An experienced player with strong pocket monsters might be able to deal with a 3-star boss solo, but with 4 and above it gets trickier. Enlist your friends or check out social media for local Pokémon GO groups. It's probably one of the most fun activities in the game. Pokémon Go is a battery killer: plain and simple. It requires internet, GPS, your camera and lots of screen-on time. To get more out of your device, head to the Pokémon Go settings menu (tap your Poké Ball then hit the settings icon at the top right) and you'll find a battery saver function. Enable it. Also consider turning the vibration off to save even more battery, though it does make the experience a little less fun. Similarly, the classic 'turn your display brightness down' tip will work well here too. You can disable the AR component of Pokémon Go to make Pokémon easier to catch. Not only that, but it will also save battery life in the long run. To do this, tap the "AR" symbol at the top right of the screen when you encounter a Pokémon. This does really ruin the atmosphere of the game, though, so I recommend it only if you’re really serious about catching Pokémon at all costs. Unlike Incense, Lure Modules don’t just affect the person who placed it, but anyone in the area. Though the effect works best for the original user, if you’re with friends or see it on your map (represented as confetti at a Poké Stop) make sure you take advantage of this. Beware, however, that some people have used Lure Modules to tempt people into secluded areas to rob them. Be careful that you only make use of it in safe areas. Here's a neat trick to getting Pikachu as a starting Pokémon. When you create a new account and start the game, the professor will ask you to catch your starting Pokémon. Rather than catching a Bulbasaur, Charmander or Squirtle, walk away from them instead. Keep walking until your device vibrates and the three starter Pokémon appear next to you again. Repeat this several times until a Pikachu pops up. Catch him to make him your starer Pokémon. It's not guaranteed that you will capture every Pokémon you want to, so don’t waste Poké Balls on creatures that are too strong. How do you know which ones you can snag? Easy, when you see a Pokémon, look at the colored ring surrounding it: the smaller it is, the easier it will be to capture. The color of the ring is also a big clue here. If it's green, it means it will be easy to capture. Yellow means it will be a little more tricky and red means they will be difficult to bag. If you still want to snag that high CP Pokémon, you'd have better luck with Great and Ultra Balls. Though it’s important to catch a lot of one type of Pokémon to evolve your favorites (see point five), it’s also worth exploring beyond your usual area: the type of Pokémon you can catch changes depending on where they are found. This is another tip I missed out on for my first few levels. If you tap and hold a Poké Ball before launching it at a Pokémon, and begin moving it in a circular motion, you will starts to see sparks fly. Release it once this happens to make a curveball throw. This will not only give you 50 extra xp, but a higher chance to catch the Pokémon. Don’t waste coins buying Poké Balls: these are readily available at Poké Stops and finding these is one of the most enjoyable parts of the game. Furthermore, Poké Stops refresh regularly, so it’s not really necessary. If you're going to spend coins, best put it into Incense or Lure Modules to help you get more XP, Stardust and Candy. Another great option is the bag upgrade, which will increase the max number of items you can carry by 50. Poké Eggs hatch after you've traveled a certain distance. However, you can't simply drive around in a car to make them hatch faster. It's said that the top speed at which you can travel while ensuring your egg incubator still works is 20 mph; when your device is traveling at any speed below that, the distance still counts towards the egg hatching. People have tried a number of different things to speed up the process, like attaching their phone to their dog or ceiling fan. For us, the best idea is simply to have Pokémon Go active while you ride a bike. You travel greater distances much faster without going over that 20 mph limit. Each level you gain in Pokémon Go will present you with some new items. Above you'll see the list of what you'll receive. If you want to let your child play Pokémon Go on your device, but that's all you want them to do with your phone, then there's a simple solution: screen pinning. This feature allows you to lock your phone to a specific app or screen that can only be left once you enter your PIN code. If your device is running Android 5.0 Lollipop or higher, go to Settings > Security > Screen Pinning > and switch it to On. Now, open Pokémon Go, and then tap the recent apps button: you will see a pin icon next to your most recent app, which should now be Pokémon Go. Tap the pin and then you can hand your phone to your child. Pokémon Go will be the only app accessible until you enter your lock screen code again. Pokémon Go doesn't have an in-game chat function, making communication with fellow players difficult (unless they happen to be right next to you). Messenger for Pokémon Go is an elegant solution which runs in a pop-up window inside the Pokémon Go app. Register with your faction and you can easily chat with other players nearby, or even create group chats. It's incredibly useful if you want to organize big groups for raids. Until Niantic creates a native messaging solution, this is your best bet. Think those Pidgies you keep finding everywhere are useless? Think again! Since they only need 12 candy to be evolved, they're great level up fodder. Catch them every time you see them and don't evolve them instantly. Instead, wait until you have a lucky egg (it doubles the experience you receive for 30 min), use it and start mass evolving. You will be able to reach the next level in no time! For those that want to try even harder, you can also use a lure at the same time for that ultimate experience boost. If you've played for a while, you probably know the most common methods to get stardust - catch more Pokémon and hatch more eggs. However, you should always be on the lookout for Pokémon that have a weather boost, since you receive more stardust from catching them. Hunting evolved Pokémon is also a great strategy, since a 1st stage evolution gives you 300 compared to the regular 100 and a 2nd stage gives you a whopping 500 stardust. Finally, a cool method to get a little stardust that's not known to many players is feeding berries to friendly Pokémon in gyms. It only gets you 20 for each berry used, but if you have a lot of them gathering dust (of the regular variety) in your inventory, it's a worthwhile trade. Understanding the best time to evolve your Pokémon is a nebulous part of the Pokémon Go experience. Thankfully, there's an easy tool you can use to work this out. PoGoToolkit is an online calculator that attempts to predict the outcome of a Pokémon evolution based on the type of Pokémon it is and its current Combat Power. Enter these details into the calculator and hit the evolve button to see the estimated result. After you've evolved your Pokémon, it's time to conquer some gyms and battle some friends. However, CP is not always a reliable indicator of power. The appraisals from team leaders can be vague too. This is why we suggest the Calcy IV app as a solution. It can be used as an overlay and it gives you detailed info about your Pokémon, such as damage per second (DPS), PvP combat power, max possible CP and so on. One of the major additions to the game in 2018, field research lets you complete common tasks in Pokémon Go and earn rewards in the form of items, XP, and even encounters. Special Research quests can even uncover new Pokémon, including the ever elusive Mythical Mew. Delete tasks that are hard to complete. If you get a Raid task after Raids have ended for the day, or a catch-task for a type of Pokémon that's unlikely to spawn due to location, time, or weather, you can delete it and get an easier task instead. Stack tasks that are similar. If you have identical or near identical tasks, or even complementary try to complete them at the same time. Example: if you have to catch 10 Pokémon and you have to hit 3 Great Throws, go for the Great Throws on those 10 Pokémon. Don't be afraid to fail. Unless the task specifically says you have to win, all you really have to do is try. So, you can do a Raid, lose, and often get credit anyway. You can even lose repeatedly to knock a bunch of Raids off your list. There are ways to exploit Pokémon Go's new gym system to mount devastating attacks and take down any gym with ease. It just takes a little co-ordination and tactics. Typically, it requires three battles per defender to take down a gym. If it's a full six defenders, that's 18 battles. If you attack in groups, usually you all go together and it still takes three rounds or up to 18 battles for everyone. If you attack in waves, though, you can get that down to one round each. When attacker 1 defeats defender 6, they can either stop or jump in and help attacker 3 with defender 4. Either way, by the time attacker 3 is done, the Gym should be defeated. A smart move is also to focus on taking out one Pokémon at a time, making it less likely other defenders will get notifications and start feeding berries to their team's Pokémon. Make sure the first defender is gone for good. If not (someone could be remotely feeding it), attack it again. If so, move on to the second defender. Repeat until all defenders are defeated and the Gym is empty. Combining these two tactics, you can take down any gym quickly and easily. Pokémon Go still suffers from the occasional bug (and I don't mean Weedles). One of the most common Pokémon Go problems so far relates to servers but many people have reported freezes and crashes, as well. Most of these problems can be fixed by restarting the app, but you can also visit this Pokémon Go server status site to make sure that the server in your location is still up and running. If it's not, you'll have to wait until it's back online before you can continue your adventure. Finally, please be safe out there in general. It's only a game but it's actually causing physical harm to some people. I was nearly hit by a car playing it this morning. No Pokémon is worth three days in ICU. Do you have any other Pokémon Go tips that could help our readers (and myself)? Let us know in the comments. With contributions from Sophia Neun of AndroidPIT.de. Note: this article has been rewritten and updated since its first publication. Comments might not reflect current content. This is a fantastic guide, it is extremely helpful for anyone struggling in the game. Thanks for writing this helpful guide Scott. Create your own Pokemon GO! Note: The camera implements markerless augmented reality by using a gyroscope like Pokemon GO. It's easy to set up the asset for marker-based AR like Vuforia. AR Basketball GO - Unity Asset - simple arcade for mobile platforms with realistic physics of a basketball net and hoop. Tested with iOS 10.2 on iPhone 6. Tested with Android 6.0 on Samsung Galaxy S7. This guide is great. The only thing it might benefit from is a basic strength vs. weakness chart. I know they populate your team with the Pokémon they think best, but in many instances I found myself using a different line up or order based on the opponents weaknesses and mine. Nice, it still drains out my battery because I cannot stop playing everyday. Thanks a lot, Scott Adam Gordon! Pokemon Go will now become terror of batteries. If you download and run Ingress, you will see areas around you where clusters of XM sit. I have found this to be a direct correlation where you will find Pokemon. They refresh every 20 minutes. If you found this to be helpful then choose the GREEN team in INGRESS!